Having the right and best yoga mat can make a whole lot of difference in your yoga session. From comfortability to portability, the best yoga mats should not only be the best in terms of benefits but should also be the best bang for your bucks. Below are the BEST YOGA MATS that will make you enjoy more your next yoga class. Checks almost all of the basic stuff you need for a yoga mat, great for beginners! Not as cheap as the others but one of the best if not THE BEST! With its non-slip cork surface, this yoga mat becomes more stable with heat and sweat. Cork is naturally antimicrobial and odor-free with self-sanitizing properties. Simply a unique mat and a new approach to yoga mat compared to your common rubber mats. Microfiber surface and amazing designs! Simple design with a closed-cell surface that prevents sweat from seeping into the mat and that prevents bacteria breeding. Premium material, thick print and awesome designs. Extra thick yoga mat but lightweight, best for beginners and people on a budget. May not be the best but surely the best yoga mat you can get for the price. 100% renewable and recyclable cork material is used. Provides comfort and support while keeping the premium look and feel. Bath time can be fun and dramatic but essentially, it’s time for your little one to get clean. A gentle and sturdy washcloth will make this comfortable for your baby and easy for you. Teether – moisten and freeze to use as a soothing teether to chew on. Mealtime cleaner – use it to wipe down messes during meals. Diaper change – comes in handy when a simple diaper change becomes messy. Use this list of top washcloths for babies and choose the best for your little one. Why Should I Get Washcloths For My Baby? It’s possible you already have a good supply of nice and soft washcloths in your house. You might be wondering why you need to add to your already vast collection when your baby arrives. One important thing to keep in mind is babies tend to have sensitive skins and regular washcloths might be too rough for them. Investing in the best baby washcloths available might be one of the best decisions you make for your child. Babies shouldn’t be scrubbed, they should be washed with gentle strokes from a soft washcloth that will be forgiving on their skin. Before you go out shopping for best baby washcloths and towels, take some time out to consider the following factors. Your baby has really nice smooth skin and you don’t want to introduce something that will irritate it. Some washcloths are made of pure bamboo and others are made of cotton. Bamboo washcloths are best for your baby if they have super sensitive skin. The hypoallergenic quality is to thank for this. Bamboo is also eco-friendly, antibacterial and becomes softer with each wash.
Cotton washcloths are very soft. The most popular for washcloths are Turkish and Egyptian cotton. They are very durable. Choose a fabric you can wash many times without pilling. This can turn the softest fabric on best baby washcloths and towel rough. Tightly knit materials won’t pile as easily as loose or short fabric. Washcloths come in varied sizes. Choose a size that will be comfortable to hold and make bath-time easy for you and your baby. A 10” x 10” is a great choice as there is enough room to hold. In the machine always check to make sure the washcloths you buy are machine washable. Also, use special baby detergent to wash best baby washcloths. This is in case your child is allergic to the stronger chemicals in regular detergent. How Many Washcloths Do I Need? There is no fixed perfect number for washcloths. It all depends on you. If you are okay with doing laundry often, you can get a small pack of 3 to 6 washcloths. If you would like to cut down how often laundry time comes around, get you a pack of 12 or more washcloths. You can hang them in the bathroom to dry but there is a great chance it won’t be dry enough to use for the next bath. Although you can reuse washcloths, it’s better not to since they get quite dirty. Now let’s get into the juice for today. We have scoured a good list of products and reviews to bring you the best options there are. Here is a review of the best baby washcloths we found with pros and cons. This valuable set of hooded towel and washcloth is a real bargain. You get two 100% cotton, super absorbable bath-time necessities in one set. The set has a stylish print and different colors you can pick from. They are machine washable to save you the hassle of hand wash. Does not produce excessive lint. The towel is a bit too thin. 30” x 30”, not as big as other available options. Mothers who love to play with colors and still match their baby’s items will love this pack of 12 washcloths. There is a mix of solid colors and patterns to enjoy in the set. Because there are so many in one pack, you can use some of these washcloths in the room for diaper changes, kitchen for mealtime and bathroom for bath-time. They are machine washable to save time. Cuts down how frequently you have to do laundry. Soft and gentle for baby’s sensitive skin. They shrink a bit after they are washed. There is a gentler side on every washcloth, be careful to use just that. If you have really sensitive skin and worry your baby might too, this is one of the best washcloths for baby available. This set of five washcloths is free of decolourizers and formaldehyde. At 12” x 12”, they are bigger than regular washcloth size and great for handling. You can repurpose them in the house after your baby is grown. They are thick with six layers of fabric. Perfect for babies with eczema. They are said to be machine washable, but hand washing will ensure they will last longer. If you are on a super tight budget, this set of two towels and two washcloths is a perfect pick. The fabric is quite light and you might feel better about getting them dirty. They are made from a blend of 20% polyester and 80% cotton. The towels have cute hoods to secure your baby’s head from the cold after a bath. They are soft but durable and hold up with repeated washes. You get a matching towel and washcloths. Thin and easy to wrap your baby. 30” x 26”, the size is smaller than other options. Because they are thin, they soak up fast. If you prefer organic products for your baby, you will love this set of 100% cotton washcloths. They are very soft and come in soothing natural colors. The pack of three is perfect for a gift and their sizes are also excellent for handling. 100% cotton makes it super soft. The edges tend to bunch up after they are washed and makes them difficult to fold. This set of six washcloths is made from pure bamboo. This makes them hypoallergenic, eco-friendly and also very durable. The material is very soft and will suit a baby’s sensitive skin while the anti-bacterial qualities is a bonus. The washcloths are 10” x 10” making them the perfect size for handling. Highly rated by many childcare gurus. This set of three washcloths are made from 100% cotton muslin. They are 12” x 12” in size and have an already attached loop for easier drying. They get softer after every wash and come in the most adorable designs and patterns. Parents can repurpose them as burp clothes and little security blankets. Made with four layers of muslin. Some parents don’t like big washcloths. This set features 1 bath mitt and 2 washcloths. They come is beautiful colors and are a standard 9” x 9”. The bath mitt is perfect for washing your baby’s hair without getting soap in their eyes and also for soft cleaning. These 100% cotton washcloths are soft and can be paired with matching hooded towels from JJ Cole. The brand is available in many stores and even online. Has a matching bath mitt. The colors at the edges fades after several washes. If you plan to clean up very often, this is the best baby washcloth set for you. The pack of 12 has washcloths in different resonant colors and you can choose between two distinct styles. It is made for cotton and soft enough for baby’s skin. Very soft for baby’s sensitive skin. Comes with a toy for bath-time fun. Nicely packaged and will work as a gift. Smaller than other available options. If your first and most important priority for a washcloth is gentleness, this is the option you should go for. The Motherhood Collection brand is particularly popular for being super gentle on babies. If you don’t want to worry about hurting your baby during batch-time, this set of six 10” x 10 washcloths is your best bet. Made with 100% organic bamboo. Only 6 washcloths in a pack. This set of 6 washcloths is made from 100% bamboo. This means it is hypoallergenic and great for babies with extra sensitive skin. It comes in soft natural colors and very soft to touch. If you care about the environment, this is an eco-friendly option that can be repurposed even after the baby is grown. The best for babies with eczema or extra sensitive skin. Large size of 10” x 10”. Perfect thickness for different uses. There are only six in the pack. This set of washcloths is popular for being practical and long-lasting. Made from 20% polyester and 80% cotton, this set of 10 best baby washcloths is soft and nice. With a size of 9” x 9”, it is also easy to handle. Washcloths in the pack come in beautiful designs. Because they are so many in the pack, parents don’t have to do laundry as often. There are matching hooded towels you can buy with this set too. Great if you are on a budget. Varied colors and designs to choose from. Are a little thin and fragile. Colors begin to fade after many washes. This set of 6 washcloths is made from 100% cotton. It is really soft and the washcloths have pretty colors and patterns for matching with other bath-time necessities. It is a good 12” x 12” making it great for handling during a bath. The pack is budget friendly. Solid colors and patterns available. Only 6 in a set. This 100% organic bamboo set is ideal for mothers who want natural products. The towel is a good size of 40” x 28” making it a good size to use until your baby is grown. It is hypoallergenic and very soft to touch which means it is ideal for babies with particularly sensitive skin. The big size is suitable for toddlers too. Less risk of smell or mildew because it dries up very quickly. Towel has a cute hood with ears. Some loose strands appear after machine wash.
Snags easily on different materials. This set of 6 organic washcloths is made from 100% bamboo. This makes it antibacterial and hypoallergenic. They are a good size of 10” x 10” and easy to handle during bath-time. Holds water and soap well. Still soft when dry and can be used to wipe the baby. Unraveling is not so easy. Thick and soft so might take a longer time to dry. You don’t have to get stressed up over finding the best washcloths for your little one. With a little homework and some help from this comprehensive review, you will easily be able to make a perfect choice. We know there are many options to pick from, but you can find the best baby washcloths when you consider your priorities. People work, people get tired, people rest, and they work again! This is probably true for most us. No one is immune to getting exhausted. Unwinding is thus, extremely essential to prepare ourselves to embrace the next day’s challenges. Relaxing on a massage chair can be one way to release the stress. Jobs which involve long sitting hours on computers or even lifting of weights etc. have huge side effects on our body. So many of us, especially the ones involved in physically demanding jobs, wish if they could stretch well. But not many of us have the luxury of time (and money) to visit spas frequently. Talk about massage chairs, and voila, it feels as if it’s all that anyone could ever ask for! (No exaggeration!) A study claimed that over 50% of the people who sought using massage chairs were over 25 years of age. The figure makes sense, as people start to work around the same time. Think about coming back home after a long day’s work with an aching back. For women, it’s many times even worse, because of added responsibilities of looking after their homes. Picture this, that you could be easily relieved of your back’s soreness! It’s easier to do so for real, now more than ever. Reports show that massage chairs help improve blood circulation, stabilize blood pressure, relieve stress, muscular tension. It has been observed since generations that many women develop chronic back pain during their pregnancies. Proved to have no adverse effects on them, massage chairs are a godsend gift to them. Call it wishful thinking, but it’s actually feasible to bring a massage chair to your home and leave your bad-back or sore neck days behind. These chairs are now increasingly simulating human touch and movements and unlike Spa’s time limits, they promise availability for a good 20 years. To make things simple for you, we reviewed Panasonic, which has been manufacturing Panasonic Massage Chairs for over 35 years. The brand, operational for 100 years now, has created a name for itself by investing in futuristic technologies, which are aimed at making people’s lives easier. They are highly praised for their function-oriented designs, making them one of the most favored brands in the world, especially their electronic devices and equipment. With this brand, there’s something for everyone. This is the primary offering by Panasonic in the world of massage chair. It is one of the members of the series known as “Urban Collection”. The chair is equipped with basic massage modules and can provide decent overall body massage. Feature: The distinguishing feature of this chair is the control over the position of the back. This helps to customize and improve the quality of shoulder and back massages. The EP 1285KL is the pocket-friendly option amongst the various varieties of massage chairs offered by Panasonic. It replaces the need to visit your massage therapist. Heck, you can practically have a massage therapy every day at your home. EP 1285KL is the latest offering in the mid-price range of the Panasonic family of massage chairs. The chair is equipped with air ottoman system along with auto recline feature and advance 4 massage styles. It is pre-loaded with 4 massage programs, namely: Quick, Chiro, Swedish, Shiatsu. The chair is equipped with a remote control for easy accessibility – all the functions are available at the tip of your finger. There are multiple manual massage options which can be used individually as required by everyone. Panasonic’s patented technology, Air Ottoman System has proven to be excellent for Improving blood circulation in the lower half of the body, the calf muscles, and the toes. Their wide Massaging Option is great for people who are looking for a replication of human touch. One of the best features of the chair is the option to stretch legs. This provides an added comfort to the users. Even though the chair performs its functions really well, there have been repeated complaints regarding its build quality. Some customers may find the electric motor’s quite irritating at times and prevents them from relaxing completely. The next massage chair up here for discussion is the EP – MA03K. Like all other models of Panasonic massage chairs, this chair is designed to help customers achieve muscle relaxation like that in therapy. The chair comes pre-loaded with 4 programs focussing on eep Tissue’ massages. Users can select specific massage regions like neck/shoulders etc. The chair is designed such that it accommodates a wide variety of body types, from the 50th percentile(150cm) to the 95th percentile (185 cm). This chair also comes with Panasonic’s ir Ottoman System’ which helps to improve blood circulation. The chair has an adaptable chassis which is equipped to handle a wide array of different physical features. The chair is equipped with over 108 different programs which are perfectly suited for one’s personal needs. Though packed with the latest technology, it is still not at par with the higher priced models and lacks great build quality. This is one of the first ones from Panasonic’s futuristic line of massage chairs. The distinguishing factor of this model is its compactness. This chair’s design is nothing less than an engineering marvel. The compact size makes it suitable to accommodate this even in small-sized living spaces. The chair is built on an S-track chassis which allows the massage rollers to smoothly follow the natural contour of the human spine. Prior to the start of the massage, the chair scans the body of the occupant and defines the optimal pressure points for best the comfort experience. Selective message locations are available like massages for neck, shoulders etc. This chair offers 14 air-bags to provide more comfort and better blood circulation. This one is like the earlier model with slight improvements to cater to the needs of the customers. This chair also features the classical S-track chassis and offers a plethora of massage options along with pre-programmed massage modules. This chair is famously known as the Shiatsu chair. The chair is equipped with the “Voice Guidance” system to help customer easily identify the different complex massage modules. The chair is the second in the series of the Panasonic’s famous “Real Pro Ultra Series”. The best feature of this series is the leg and shoulder stretch. The chair comes equipped with the new massage technique called the Junetsu. In this new technique, the pressure is applied in a small rotatory fashion to allow penetration of its impact beyond the muscles, to the bones. The chair has dual recliner options. The first option is for massage and the second is for the recliner. EP-30004 comes equipped with a self-programming feature. You can program the chair to retain massage programs according to your needs. The chair is equipped with arm pads to provide arm massage. The memory feature provides customers to return immediately to the pre-set options for recurring pain options. The chair is equipped with 4 different message type options and 5-speed options to provide a diverse choice of options to its customers. The chair has 22 airbags which are significantly higher than the previous option. The design of the chair is mechanical with a high importance of the functional aspects. The creative aspect is on the lower side. The chair lacks media support, it has no provision to play music during massages. It also lacks temperature control. The chair has the trademark Panasonic -Track’ chassis, which is quickly being adopted overall. This chair also features a 3-D scan option, with an extension of the scan facility to include the head. The massage rollers follow the contour of the spine to provide the desired relaxation. The chair also features heated rollers specifically for the neck and head region. Additional heat provides extra remedial value. The chair comes preloaded with massage programs for specific body regions like neck, shoulder, hip and lumbar area. This is one of the few massage chairs available in the market with the deep massage feature. People suffering from recurring pain in their back and the lumbar area can benefit heavily from this feature. The chair has 3 slots to store your personalized massage options. The chair offers a body stretching mode which is like the adjustments done by a chiropractor. Even though the chair offers 33 airbags, it is still lagging behind other massage chairs in the similar price range. The chair has airbags only for massage of the lower extremities. There are no rollers, so the message options for feet are limited. The lack of rollers can be off-putting for many customers. The chair also lacks media support, so you won’t be able to enjoy music during your therapy sessions. The default setting of any given massage module is set fixed at 15 minutes. The Panasonic EP – MA73K looks like a simple recliner unlike its brothers and is without a doubt one of the better-looking massage chairs in the market. The chair has high attention to the detail towards the contour of the subject. The massage feature mimics the feel of a human touch. It also accommodates rollers for both, back and neck regions. The rollers are also heated to provide the added comfort and relaxation. This chair offers a higher number of massage programs compared to earlier models. It offers 5 programs in comparison to 4 provided by each of the earlier models. The chair features massage systems for the palm and forearm region. The chair features around 33 airbags which are significantly lower than competitors in the same price bracket. One of the best offerings by Panasonic is the MAJ7 model. This model features a comprehensive massage program with complete all-around features. The massage modules mimic human touch to provide added relaxation. The model has “Voice Guidance” feature to explain the numerous features to the customers. The chair has enough flexibility to accommodate from the 5th percentile till the 95th percentile of the population. The chair features 6 pre-programmed massage programs like shiatsu massage, neck and shoulder massage and programmes specifically for the back. The chair features 37 airbags for higher comfort. The magnitude of each massages types can be calibrated individually to suit personal needs. The massage of neck, shoulders, and back of this chair is unparalleled throughout. Foot rollers, in combination with airbags, provide unmatched relaxation of the feet. The padding of the chair prevents customers from taking full advantage of the neck/shoulder massages. The forearm massage is ineffective at times and can be coupled with the stretching programs for better results. The timer for each message is fixed and turns off automatically which is unpleasant for customers at times of relaxation. Panasonic introduced this chair with the highest number of massage combinations available in the market for the price point. The chair features 36 airbags for comfort and relaxation. The chair features a staggering 1000 massage combination. The number is unmatched by a competitor in any price range. The chair comes pre-equipped with several massage routines like Swedish massage, deep tissue massage etc. The chair is highly flexible and can accommodate people of the height of 195 cm. 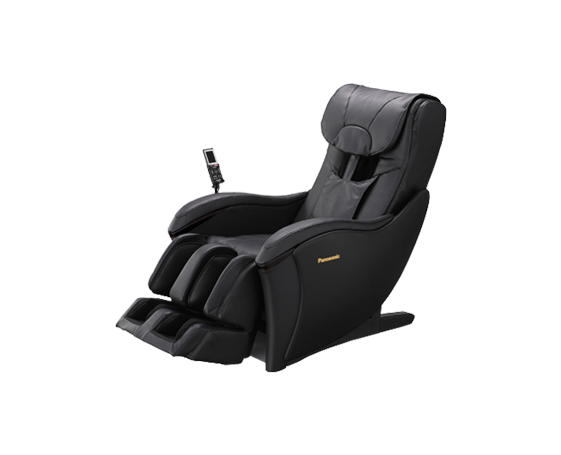 The largest number of massage combinations available for any chair. The chair is highly versatile and flexible and can be modified according to your needs. The number of airbags is on the lower side comparing the price range. Lack of media supports in the chair. The lack of heating feature is most probably the biggest drawback of this chair. We hope that you would have found the above information useful. And we are sure that Panasonic Massage Chairs would prove to be an excellent purchase for your house! Our verdict: take the one which isn’t the most basic of all but the one which suits your needs within the budget. It will prove to be a great investment. Good luck!